Use DivorceWriter to prepare your Supreme Court of Ohio Uniform domestic relations forms. You will receive all documents you need to get a dissolution or a divorce in Ohio, ready-to-file, with complete filing instructions. At least one spouse must have lived in Ohio for at least six months before the divorce is filed. In Ohio, if you want to end the marriage, no other grounds are needed. Ohio has two options for ending a marriage--dissolution or divorce. A dissolution is essentially a simplified uncontested divorce. It ends the marriage just as a divorce does, but requires fewer documents. 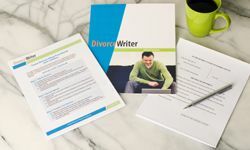 You can choose either option with your DivorceWriter Ohio purchase, allowing you to easily change from divorce forms to dissolution forms at any time at no additional charge. You have qualified to use DivorceWriter to complete your Ohio divorce papers online. Select "Continue" to start the interview.